The Secret Recipe Club is broken into 4 groups and each group has their reveal on a Monday each month. Group A is the first month, Group B the second and so forth. But there are a few months out of the year where there end up being 5 Mondays. It was recently decided that on those months, there would be a themed Secret Recipe Club reveal where members of any group could participate and we’d all share on that 5th Monday. It’s a great way for bloggers to see recipes from members outside their groups. Of course, I immediately signed up. Seeing as today is the fifth Monday in August, it’s a themed reveal day. The theme is Tailgating foods. Now, would you believe I’ve really never tailgated? I’m sure I’m going to cause some people to gasp in horror, but football is incredibly boring to me. I just don’t get it. It’s significantly more interesting if you’re actually at a game, but even then, the idea of creating foods to tailgate with is more fun to me than watching people run around with a football. I know, I know. 1. Bring a large pot of water to a boil. Add potatoes and cook until fork tender. Transfer to a plate and allow to cool. 2. Once cooled, remove the skins from the potatoes and roughly chop. 3. In a large bowl, whisk together the rest of the ingredients (except optional bacon and hard-boiled eggs). Add the potatoes to the bowl and toss to coat. 4. Fold in bacon and hard-boiled eggs if using and transfer to a container with a lid. Refrigerate, until chilled. I really should have halved this recipe because it was only me, my mom and my aunt at my mom’s house to eat this. 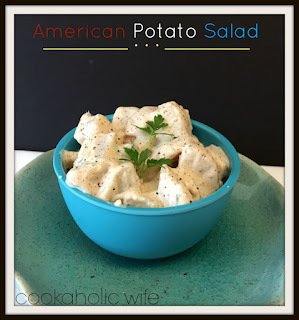 My weirdo husband doesn’t like potato salad for some reason. Anyway, my point is, a recipe like this is easily halved, or doubled, even tripled, depending on the number of people you need to feed. I intended to add bacon to this recipe but somehow managed to be completely out when I was making this. It’s a rare, rare day for this house to have no bacon, but luckily it was optional, and despite bacon usually making everything better, this potato salad really doesn’t need anything else to be delicious all on it’s own. I'm with you husband…no thanks to potato salad, but I know my husband would like this recipe! He's always asking me to make potato salad and I never do. I know…I'm such a bad wife. Thanks for making my recipe for SRC! We enjoy the flavors in this mild potato salad. Such an American dish for an American sport – great choice. Love potato salad, and I see yours has the must have ingredients, hard-boiled eggs. Looks so good! 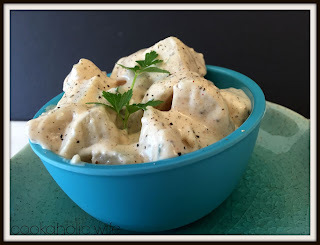 My favorite version of potato salad. Just like Mom used to make. For someone who never tailgated, I think you did a great job with your assignment! Hope you had a nice Reveal Monday! That sounds delicious! Love the addition of bacon and capers! Yum, so creamy. Perfect accompaniment to tailgating.